Do what you love and the rest will follow- the Forward Detroit gallery is a testament to this statement. 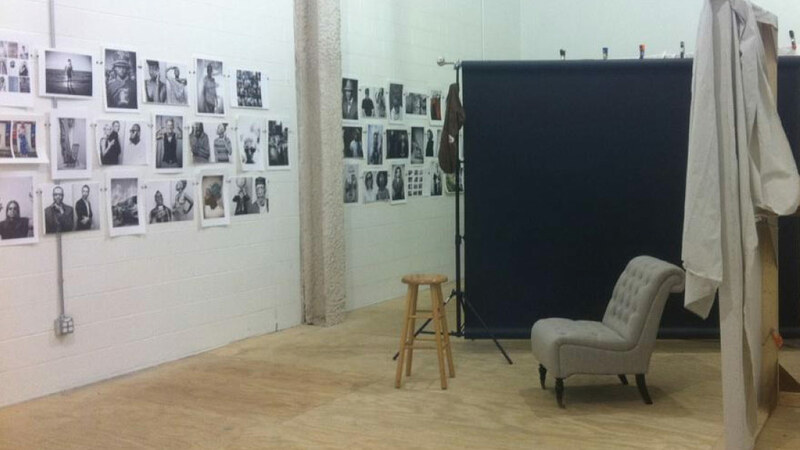 The space, located in the heart of Greektown, is a temporarily donated by Opportunity Detroit. Eric Perry’s portrait show of 20 plus Slow Roll riders led to the pop up gallery that is now housing a floor to ceiling portrait project. It’s hard to recall the moment a commitment was made to getting on a twenty foot ladder with a nail gun to arrange and rearrange hundreds of prints over the course of four months. Although the moment is lost, its impact is felt when standing in a room full of hundreds of beautiful and expressive faces. Life long Detroiters, newcomers and people directly responsible for revitalizing Detroit have walked through the doors and their images hang on the walls. Some faces are only seen once, while others visit many times to talk or even collaborate with the project. Forward Gallery is a hybrid of a studio/ gallery/ creative space. It was loaned with the spirit of artistic collaboration and with the intent of showcasing the existing richness of Detroit. The current use of the space carries out it’s original intent by including and welcoming the community it inhabits.